This is it! Today's the day! It's time for a GIVEAWAY! 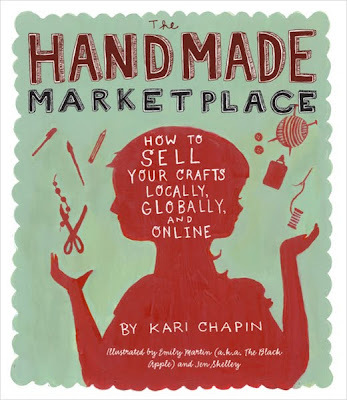 I'm giving away a copy of "The Handmade Marketplace: How to Sell Your Crafts Locally, Globally, and On-Line" by Kari Chapin. This book is perfect for anyone interested in getting their craft business off the ground. Then it's on to selling. The boom in indie craft fairs and sites such as Etsy (Your place to buy and sell all things handmade) is providing artisans with an ever-expanding marketplace for handcrafted items. Chapin demystifies every venue. She explains the guidelines that craft fairs impose on exhibitors, the typical yearly calendar of shows, and how to start a new craft fair. For the crafter interested in online sales, there are tips on styling and propping crafts for photographs and technical explanations of how the most popular Web marketplaces run. Traditional brick and mortar consignment stores are still very good options for many crafters. Chapin explains how to approach shopkeepers and build strong relationships. The Handmade Marketplace is an excellent source of information for the independent entrepreneur. Chapin touches on all the necessary information for anyone interested in starting their own handmade/craft brand from home. I am currently working on a high-school senior independent-study program where I am crafting my own brand. The Handmade Marketplace could not be a more perfect book for my project. I have read through many similar books, but this is by far my favorite. Chapin somehow makes what could seem like an overwhelming task manageable. The book also provides advice and interviews from so many successful, talented people who have made strides in the online indie world. As an added bonus, the book is pleasing to look at. The illustrations are beautiful and inspiring in themselves. Beyond being a super cute and attractive book, Kari's Handmade Marketplace will no doubt be the craft/indie business bible for at least the next 10 years. Questions about business cards? Social marketing? Selling wholesale or consignment? Using Etsy, Artfire or other online venues? It's all there, plus cute illustrations, stories told in the first person by today's most promising artists and crafters, and bits of information crammed into every nook and cranny. I get bored easily and rarely read a reference book cover to cover, but this one I did and have gone back and read parts twice. Highly recommended for those starting out in the business and to those with experience (I've been selling for over 5 years and found loads of good tips in Kari's book). 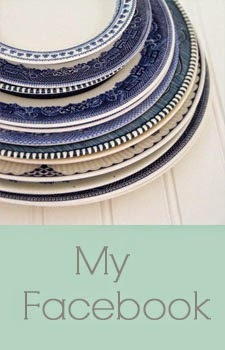 This book should be on every crafters bookshelf. A must buy small business book! Kari helps readers who are looking to launch their crafting business in several areas from how to determine cost of goods, handling market competition, the pros and cons of wholesale versus retail sales, tips on styling and propping crafts for photographs, technical explanations of how the most popular online marketplaces work, how to approach bloggers to get your work featured (the section where I stepped in with my own ideas), how to approach shopkeepers and build strong relationships, record keeping, showing your work at craft fairs and more - 218 pages of current concrete advice from Kari and her 30 contributors. I must reveal that I am one of these contributors, I wrote 3 pages of the book (pages 125-127) about how a business can attract attention from their favorite blogs. Kari did a beautiful job organizing a myriad of topics from so many voices and created an easy to follow small business book that is not at all boring (most business books can be a real snooze-a-thon) or overly technical (yawn) - instead it's smart, fresh and easy to digest and most of all, gives small business owners the tips and tools that they need to either get started or to keep going strong and forward with their business. The best $10 you'll ever spend! Be or become a follower. This is worth 2 entries. Tweet about the giveaway. This is worth 1 entry. 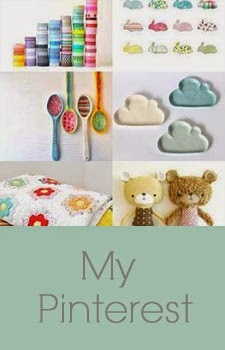 Post on your blog about my giveaway. This is worth 5 entries. I'll have Hannah pick a random number on the morning of Friday, Sept 3rd, and I'll announce the winner later that day. Me..me..meeee!! I'm a follower! And I need all the book learning help I can get! I would love to win this book! I just opened an Etsy shop and could use all the help I can get! I am a follower and I would love this book! Thanks for the give away! Hi! I am now a follower and I am going to tweet about this. Thank you! Just signed up. Your blog is SUPER (found you through FB). I signed up to blog, so maybe this will be a way for me to be inspired! Who knows? Would sure love to win the book. I am now a follower. Would love to win the book. Found you through the Graphics Fairy. Now a follower, even though I'm not quite sure what that means! ;-) Graphics Fairy sent me. Count me in! Watch out! I am officially following you. I am a new follower - following you back! Second entry for being a follower! ooh, this is a great book! i have it! good luck to everyone entering.. don't pick me! lol! 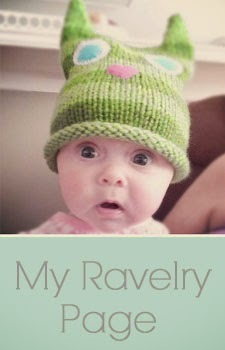 I'm a brand-new follower (came by link from Someday Crafts). I just checked out your daughter's room re-do - wow! I'm just getting set up with etsy and a blog - this book sounds like *exactly* what I need. Every new undertaking is an excuse to get more books! What a generous giveaway and so relevant to all budding crafters ! New follower. I'm always looking for thrifty ways to be creative. I am a follower! So excited about this giveaway! 2nd entry for being a follower! I just became a follower !! !